For many of the 4 to 12 million people in the US living with Interstitial Cystitis (also known as IC, painful bladder syndrome, chronic pelvic pain, or bladder pain syndrome) sticking to a certain bladder-friendly diet allows them to keep their pain in check. The extensive lists of ‘foods to avoid’ can be discouraging, and trying to only eat the ‘safe foods’ can make some people afraid to even eat anything! It can also be difficult to find bladder-friendly recipes online or elsewhere for those living with Interstitial Cystitis. That’s exactly what led 180 Medical employee Trish who has IC, to get creative and make up some of her own recipes that are tasty and easy on the bladder. 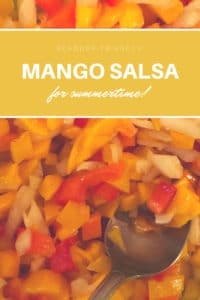 Because she could not find a mango salsa recipe without spicy peppers, lime, or citrus, she decided to make her own! Wash and cut peppers in half, clean out the seeds. Peel, wash, chop the onion, chop the peppers, put them all in a bowl. Chop the mango, clean the seeds. Place the mango into the bowl with the other veggies, stir them together, then add a teaspoon or a splash of olive oil, two small pinches of sea salt, and one to two turns of ground black pepper (depending upon what your bladder can tolerate). Stir everything together, and chill until served. Serve with grilled salmon, tacos, corn chips, chicken—you name it! Even though there is currently no known cure for Interstitial Cystitis, there are many treatments that can help minimize symptoms. Eating foods that cause less bladder irritation is a great start! Keep in mind that the different foods and beverages which impact bladder symptoms are unique for each person living with IC, so you might have to try many different options before you find the right diet for your own needs. Since many of our customers live with conditions that require them to use catheters, such as spinal cord injury, bladder health is a core focus here at 180 Medical. If you are suffering through the symptoms of Interstitial Cystitis, know that you are not alone in your personal journey. Do you have any favorite recipes from your Interstitial Cystitis diet that you’d like to share? Send them over to us so we can continue sharing bladder-friendly recipes with the IC community! September is Interstitial Cystitis Awareness Month. Find out more about this chronic condition that is often characterized by bladder pain.